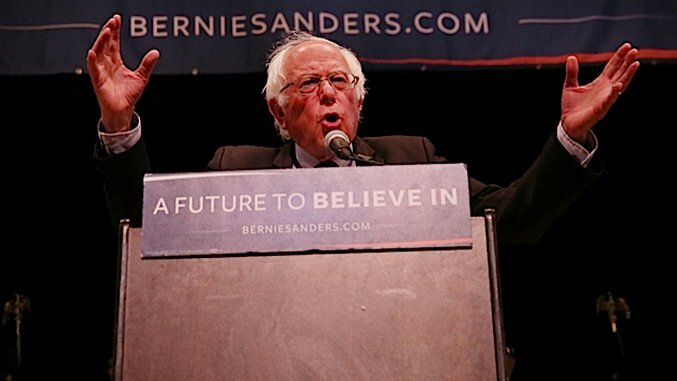 After officially losing the Democratic primary after the California primary on June 7—I say “officially” because the writing had been on the wall at least since the voting in New York—Bernie Sanders shifted his attention to the Democratic platform. The new strategy was to use his influence, measured by the millions of voters that gave him 45 percent of the overall total, to push progressive policies that might not have been included otherwise. As a concession to Sanders, and a sign that he still held some sway, the DNC allowed him to name five delegates to the platform drafting committee that met last Friday in St. Louis. Clinton named six, and DNC chair Debbie Wasserman-Schultz—a strong Clinton ally, long despised by Sanders supporters—named four. Any proposals adopted in this meeting would be non-binding. They’d still have to be approved by the full platform committee in Orlando next month, and then voted in at the actual convention in Philadelphia. Even then, they’d function as party guidelines only—a potential President Clinton wouldn’t be obligated to follow through. With that in mind, Sanders withheld his endorsement as his surrogates fought to incorporate his ideas into the party platform. He has stated that he’ll vote for Clinton, and has been vocal in his opposition to Donald Trump, but he also understood that a public endorsement would both undermine his power—which is based entirely on those loyal voters who don’t yet trust Clinton, many of whom he could eventually deliver—and invalidate him as a political force as he struggled to push Clinton to the left. The results at the meeting in St. Louis were mixed. The Sanders allies successfully introduced language to expand and protect social security, to introduce a 21st century Glass-Steagall in order to break up the big banks, to abolish the death penalty, and to advocate for a $15-per-hour minimum wage (though the Clinton camp refused to make this number universally mandated or tie it to inflation, by an 8-6 vote). None of these positions would have been possible without Sanders’ influence, as they have been at least partially opposed by Clinton in the course of her campaign. On the other hand, the Sanders camp was out-gunned on many big issues. A measure to oppose the Trans-Pacific Partnership—a position taken by both Sanders and Clinton in the primary campaign—was voted down along “party lines,” 10-5, with the justification that it would “undermine” President Obama’s situation…a clear indication that Clinton’s opposition was purely opportunistic—a way to out-flank Sanders on the left, rather than a position she intended to hold beyond the primary. Nor did the Clinton/Wasserman-Schultz bloc support a carbon tax or a ban on fracking and new fossil fuel drilling leases on federal land and water (these all failed by 7-6 votes), medicare-for-all, or an end to the Israeli occupation of Palestine. If you’re a progressive Democrat, these last few results are pretty heartbreaking. What it means is that if you support the party establishment, you also support fracking, carbon emissions, free trade, an aggressive Israeli state, and limited health care—at least in the sense that you’ve vowed not to fight against any of these things, which already enjoy prominence within the status quo and are certainly not disappearing on their own. When you consider the fact that there are no other realistic progressive options in the American political landscape with a prayer of winning major national elections, the situation starts to look pretty bleak. “The platform drafted in St. Louis is a very good start, but there is no question that much more work remains to be done by the full Platform Committee when it meets in Orlando on July 8 and 9. We intend to do everything we can to rally support for our amendments in Orlando and if we fail there to take the fight to the floor of the convention in Philadelphia. Pretty standard strategy: Use whatever power remains to fight for progressive policy concessions. If he fails, he fails, but what other options are available? There are still many Sander supporters who are hesitant to throw their support to Clinton, and those voters are his leverage. Why deliver them to Clinton for nothing? Now let’s turn to Clinton supporters. At this point in the process, with their candidate having secured victory, you’d expect them to be happy. They won! Their candidate gets to run for president, and will probably win again in November! Maybe—maybe—they’d see Sanders’ continued activism as a nuisance, if they believed wholeheartedly in Clinton’s centrism. Even that seems ungrateful, since it’s obvious to everyone paying attention that Sanders is going to endorse in plenty of time for the general election, and that whatever squabbles continue in the short term will be months in the rearview mirror when it counts. There’s no reason to be anything but delighted at the outcome so far. But that’s not the reality. The reality is that in mainstream media, social media, and—anecdotally—everyday life, Clinton supporters are furious at Bernie Sanders. Instead of viewing his platform tactics as the logical moves of a true progressive trying to claim whatever turf he can before the convention, they’ve painted him as a sore loser whose ongoing struggles are both audacious, presumptuous, and arrogant. In their minds, he should fall in line with Clinton completely, as Elizabeth Warren has, and unite the party against the dangerous Donald Trump. If anyone ought to “stand up, be bolder than you have been” it’s Sanders. He lost the race for the nomination. And he won platform planks from a party he views with contempt. So, “stand up, be bolder than you have been,” Sen. Sanders. Endorse Clinton already and exit the race. Yes, how bold it would be to give up! Imagine his courage if he had never run, or, better yet, if he had just started accepting lobbyist money in the early ‘90s when he first entered the House. And if we’re being honest, if the guy had any balls he would have joined the Young Republicans at the University of Chicago. Why is Bernie such a coward? Now seems like a good time to revisit the fact that Clinton has already effectively won the Democratic nomination over Sanders, not the other way around. It’s good to remind yourself of that fact because from reading Sanders’s quote above, you would assume he won. Uhhh…no, you wouldn’t. He obviously has enough influence from his primary loss to have a say in the platform, and he has the respect of enough voters that Clinton feels obligated to listen. She does have to prove herself to him, unless she believes that she doesn’t need those voters. Which, hell, she may not. Maybe she can win without them, or maybe they’ll come to her side without Bernie’s endorsement. But until she feels safe without them, he has power. Whether the Clintonites like it or not. Maybe this was inevitable. Maybe Sanders was never going to have the full stamp he clamored for simply on account of having lost. But this underplays the initial strength of his hand. Had Sanders endorsed Clinton at the end of the primaries and recalibrated as an advocate for her campaign—in short, had he mimicked Warren—he would have gotten ahead of his voters. This is important. With an early concession and endorsement, Sanders does two things: He pre-empts any natural movement to Clinton among Democratic primary voters, which lets him claim credit for her improved numbers even if they were inevitable. Like Warren, he would take a starring role in the campaign against Trump. This is nonsense for a few reasons. First, endorsing Clinton immediately would have both undercut his negotiating power and alienated his ardent supporters, who will need time to come around. The process needs to be organic, and whether Bouie wants to admit it or not, an immediate endorsement would have turned Sanders into a shiny trophy with no real influence, and diminished him in the eyes of progressives. Second, Warren has actually damaged her reputation among progressives by jumping on board the Clinton train so early, even if it helps her future prospects. The people that love seeing her and Clinton together are Clinton supporters, not Sanders supporters. Third, Bernie can be a star in the Clinton campaign any old time he wants—you think she’s going to turn him down when he finally gives his endorsement? That’s absurd—he was, is, and will remain the Clinton camp’s top prize. Now, getting past the mainstream media minds, there’s the widespread anger among her supporters on social media, the lesser blogs, and IRL at Bernie’s actions. They use the same arguments—why can’t the arrogant loser accept that he lost?—and fail to understand how he’s maximizing his leverage while he’s still got it, which won’t be for long. They also fail to understand that the slow negotiations actually make it more likely that his supporters will come around, since he’s creating the perception that Clinton has to “earn” his vote. Progressives trust Bernie, and when he eventually gives the nod, it will carry far more weight than if he had thrown in the towel without fighting to the bitter end. 1. Many of Clinton’s supporters were politically progressive before this election, and would have been quite happy with a presidential candidate like Elizabeth Warren. Happier, actually, because she embodied their beliefs—especially in the economic realm—in a way that Clinton did not. It’s the self-identified progressives, as opposed to the actual centrists, who are displaying the most anger today. 2. These progressive voters seized on Clinton’s candidacy based largely on identity politics. They wanted a female president, and the emergence of Sanders’ candidacy was a complicating nuisance, coming after they’d committed ideologically. 3. At the same time, they didn’t want to believe that they were supporting a war hawk and a fiscal conservative, because that ran against their progressive ideals. Life was better when Clinton was the only viable non-Republican option, because they didn’t have to explain themselves. 4. On some level, they recognized that their politics were more closely aligned with Bernie. Nevertheless, identity politics kept them in Clinton’s camp. 5. In order to erase the cognitive dissonance and justify their support to themselves, they employed several strategies, like falsely attributing widespread sexism to Sanders supporters, and trying to paint them as exclusively male in an attempt to efface the vast majority of young women and people of color who backed him. If Bernie and all his people were covert misogynists, then their progressivism was phony, and it was okay to support Hillary. It also erased the need to discuss real issues—a convenient out, since Hillary’s political history doesn’t stack up well from a progressive standpoint. 6. By muddying the waters, they could convince themselves that in reality, there wasn’t much policy difference between the two. 7. Adding Elizabeth Warren as an ally made them feel good, because it reinforced that idea—if a true progressive is supporting our candidate, it must be okay. 8. After Clinton won, and Bernie began to fight for the platform, the cognitive dissonance began to rear its ugly head once again. A look at the finer points revealed the truth mentioned above—that if you support Clinton, you’re also on the side of fracking, free trade, carbon pollution, increased fossil fuel drilling, non-universal health care, and a frozen minimum wage. Again, this had the potential to make them question their progressive bona fides. 9. They didn’t want to feel like political centrists, much less fiscal, environmental, and foreign policy conservatives, so yet again, they had to drum up anger against Sanders. Sexism wouldn’t work this time, so the narrative shifted—Bernie is arrogant, Bernie is presumptuous, Bernie should just shut up and pretend everything is hunky-dory. 10. In this way, their self-conception is preserved, and the narrative is once again shifted away from actual policy. The dominant discussion is not whether fracking is a good thing that should go on indefinitely, but whether Bernie Sanders is hurting the country and the party by being a stick in the mud. It’s a pretty impressive act of self-delusion. This is how certain progressives, faced with a real chance to change the country, have betrayed their own politics—and in many cases, their own generation—and handed the presidential election to neoliberals that will inevitably disappoint them. The only way to avoid looking in the mirror, it turns out, is to remain in a state of vigilant anger against anyone who threatens your feeble, contradictory belief system. In this way, they have more in common with Trump’s supporters than they’d ever like to admit.